Brett is responsible for teaching Eagle Rock’s language arts classes such as Research, Creative Non-Fiction, and To Kill A Mockingbird. He spent much of his early life in central New Jersey before attending Goucher College just north of Baltimore where he earned a degree in English. He first discovered his passion for education while working as a ropes course facilitator at Gensee Valley Outdoor Learning Center in Parkton, Maryland. This led him to pursue his Master of Arts in Teaching at Towson University. 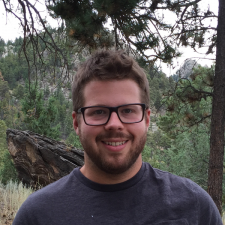 Brett then made the trek west and worked for two years as the Literature and Literacy Fellow here at Eagle Rock before moving into his new role as Instructional Specialist. When not teaching at Eagle Rock, Brett can be found playing ultimate frisbee, reading a book, drawing, or looking for the next new board game to add to his collection. He lives in Estes Park with his large cat, Rufio. Student inspire me when they are passionate about their learning and the world around them.